Mark offers a discount of 50% on their first / introductory lesson! B.Eng. B.Ed. 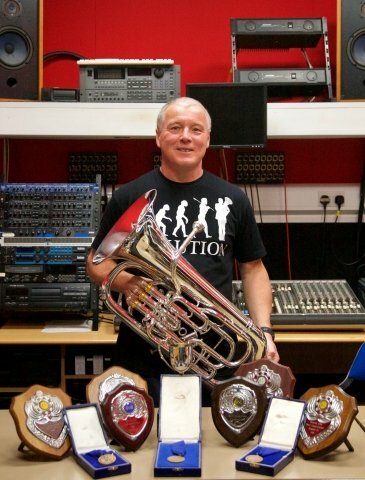 Mark is a Euphonium player based in Caerphilly. He has established himself world-wide as one of the finest exponents of this instrument. He was the 1990 British Open Solo Champion and has won the British Open Euphonium category on 6 occasions. In 1987, he became the first ever Brass Instrumentalist to win the coveted instrumental “blue riband” solo competition at the National Eisteddfod, a feat he repeated in both 1988 and 1993. As a member of BTM Band he has featured as soloist on many Radio broadcasts and on the Band’s CDs as well as at concerts all over Europe. He was the subject of a television program entitled "It's My Life" broadcast on HTV in 2000. Mark has also toured Canada and the USA as guest soloist with the Aber Valley Male Voice Choir. Mark was also a founder member of the National Youth Brass Band of Wales and in 1985 was awarded “the most outstanding student” by the tutors. He was the first past player to be invited back and perform as guest soloist with the band being directed by Edward Gregson. In 2012 Mark was honoured to receive the Caerphilly County Borough Mayor's Civic Award for outstanding work in the community. Mark has arranged and composed many pieces of music for brass band and smaller ensembles. BTM Band have their own recording studio where Mark has recorded and produced their last 4 CD’s. He also works with and records local rock bands, vocalists and choirs producing recordings for demonstration purposes as well as for sale. Mark has taught both adults and students in the BTM Band where he was the resident musical director from 1981 to 2014. The age range that he has taught is from 8 years old up to 70 years and beyond. He is currently the MD of BTM Next Generation youth band a position he has enjoyed since 1980. In addition Mark has been the MD of Newport Borough Brass Band and Rogerstone Band. In 1994 Mark joined Newport High School where he has mainly taught Music GCSE and BTEC. He has also used his electrical engineering experience to teach Science, Maths, Electronics and Technology. Prior to becoming a professional music teacher Mark regularly tutored engineering apprentices' with their college work. Mark is very passionate about Music. He has exacting standards but totally understands the obstacles and worries that many learners encounter on their musical journey. He will show you various methods on how to overcome these problems. This is done through playing the instrument and then evaluating what has just been played with a discussion on what was played well, what could be played even better and questioning the student on their thoughts on the performance. In particular tips and tricks will be given as needed together with practise routines to overcome any weaknesses so as to enhance the performance and improve confidence. Mark loves using technology to help with practising and will show you numerous ways to use it to good effect.